"“I was busting out of my fat pants when I first started,” Katie says. “And now I’m almost two full pants sizes down. I’ve lost 20 pounds in four months and I’ve got more muscle tone and a ton more energy. I just feel better.!" Katie Brunton knew exactly what she was looking for in a gym. Group training was important, as were challenging workouts. She knew that she definitely did not want to join another “big box” corporate gym. Location was also important. With her crazy work schedule Katie knew that if her gym was not conveniently located near her workplace her accountability would suffer. When Katie moved from Atlanta to St. Louis last December the search was on for her perfect gym. She began with Google, looking first for something close to her office, and very quickly came across Pursuit Fitness and Performance (PFP). 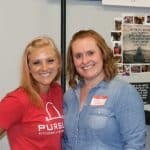 Katie signed up for PFP’s group training program and quickly realized that it was exactly what she was looking for. Between her workouts and her nutritional goals, Katie has worked hard to achieve results. “I was busting out of my fat pants when I first started,” Katie says. “And now I’m almost two full pants sizes down. I’ve lost 20 pounds in four months and I’ve got more muscle tone and a ton more energy. I just feel better.” Katie is still working toward her goal weight, but she’s excited to see how far the knowledge she learned in the Balanced Habits program will take her this summer. FAVORITE HEALTHY RECIPE? I usually make taco meat at least once a week and I’ll make salads or burritos out of it. It’s really versatile and quick meal prep. GO TO BREAKFAST? I typically make a smoothie from the Balanced Habits recipe book. EASIEST LIFESTYLE CHANGE? Drinking water has been easy for me. I quit soda a few years ago. PETS? I have two dogs named Max and Sadie. FUN FACT? Before I moved to St. Louis I used to teach self-defense classes in Atlanta. FAVORITE WORKOUT SONG? Anything that is upbeat and that I can sing along to in my head while I work out. I’m not super excited about rap music. SUMMER PLANS? I just bought a house so vacations are kind of on the back burner right now.